Titan is a transport management system that will streamline the services of any company carrying freight for clients, or supply companies managing their own delivery systems. The software covers every aspect of management and integrates seamlessly with our transport online booking system Helix. For bookings made at your client's site. Your customers can make a booking on the internet using Web Bookings. The cost of a new booking is automatically calculated by the freight rating engine. 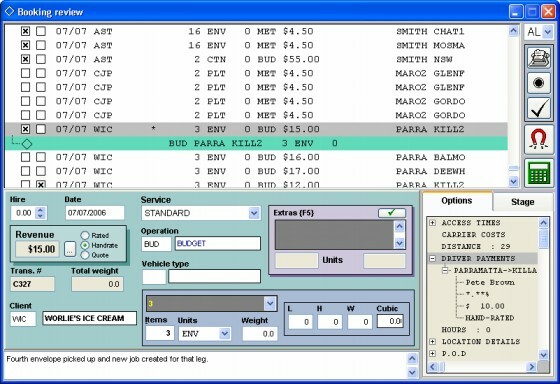 Drag & drop freight allocation with keyboard option available. Colour coding & icons quickly show freight status. Develop the most efficient route before allocating freight to a vehicle. Drivers can receive allocated jobs directly onto their mobile device in real time. Statuses and PODs are sent back electronically. Build DFM plans for long-haul. Drivers can record a driving log directly onto a PDA. Completed bookings move into the booking review area for pricing adjustments. After the adjustments have been finalised, the booking is passed onto invoicing. Ensure pricing is correct before invoicing. Apply additional charges such as tolls. Review all bookings or use filters to simplify selection. Flag clients that always require review. Customer service screens are available to review bookings within any screen. Review screens differ depending on whether the booking is a distribution run or a standard booking. Our system for mapping distances between two geographical points has been developed in-house. We can map any city and distribute the distance grids without royalty overheads, reducing your costs. This mapping system can also help in operations research techniques of best routing. Internal electronic chats can be conducted between staff to discuss particular bookings. 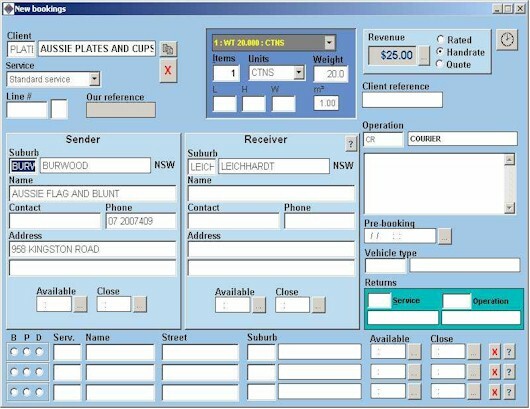 Customer service screens have been optimised for route management. Data retrieval and modification is available all in one screen.